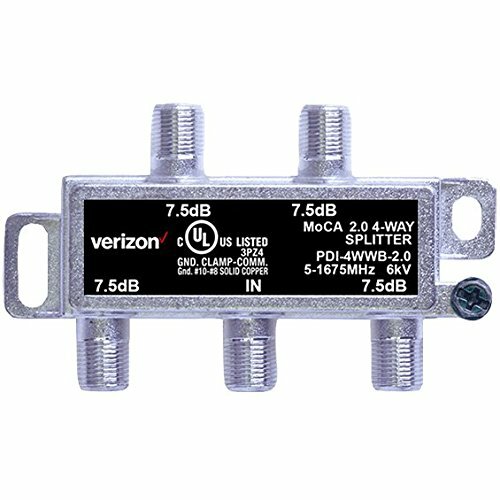 ✓ VERIZON FIOS COMPATIBLE 4-WAY COAX SPLITTER: A convenient and handy way to send your FiOS to multiple devices. ✓ ORIGINAL VERIZON FACTORY SEALED: Verizon original factory branded and sealed. ✓ EASY TO USE AND INSTALL: Coax Splitter allows one piece of coax to join with four pieces of coax. Perfect for connecting multiple TVs, FiOS Set Top Boxes, and High Speed Internet. Includes screw set for quick and easy mounting. ✓ MoCA 2.0: Coax Splitter meets specifications to support MoCA 2.0. If you have any questions about this product by Verizon FiOS, contact us by completing and submitting the form below. If you are looking for a specif part number, please include it with your message.